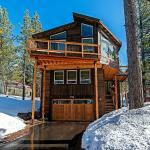 Located in South Lake Tahoe in the California region 5 Bedroom 4 Bath Luxury Overlook is a holiday home boasting free WiFi. The property features free private parking. This holiday home comes with 5 bedrooms a flat-screen TV a dining area and a kitchen. Tahoe Queen is 1.2 km from the holiday home while Heavenly Ski Resort is a 17-minute walk from the property. Reno-Tahoe International Airport is 64 km away.